A show home in the One Thousand Museum tower designed by the late architect Zaha Hadid has been fitted out by Brazilian furniture brand Artefacto. 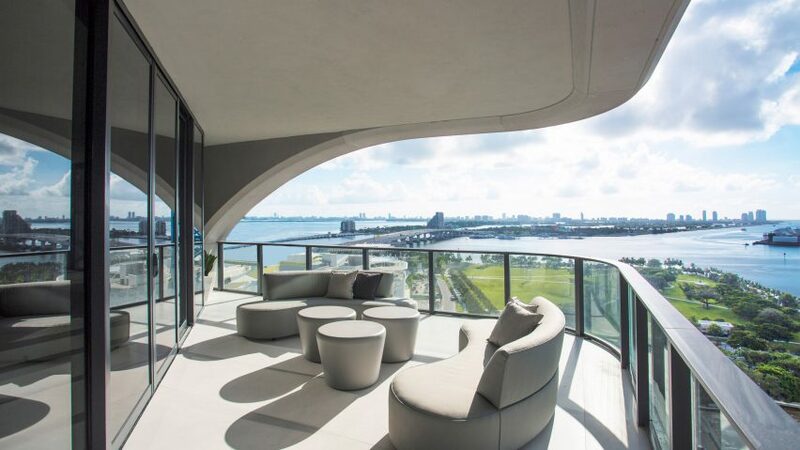 The residence – the first in the development to complete – is located on the 17th floor of the 62-storey building, which was one of the last that Hadid worked on before she died in March 2016. Construction work is still progressing on the project, with a completion date slated for late 2018, but Artefacto was asked to outfit the unit to help give potential buyers an idea of what a finished home would look like. The 4,635-square-foot (430-square-metre) apartment includes four bedrooms and 5.5 bathrooms, with floor-to-ceiling glazing wrapping the majority of the exterior. The curving concrete exoskeleton that supports the skyscraper is visible through the windows, and was used by Artefacto as a starting point for the interior. Items from the brand's current collection were chosen in neutral colours so as not to distract from the architecture. "Being asked to outfit a unit in the final tower by the late Zaha Hadid is an incomparable feeling," said Paulo Bacchi, CEO and president of Artefacto, which has its US headquarters in Florida. "Zaha was, and will forever be, a design genius and cultural icon and it is an honour to merge our vision with her legacy." Artwork for the apartment was selected by Sarah Jane Bruce of SJB Fine Art Services and Flavia Masetto of Flavia Masetto Fine Arts. The home has already sold for $6.8 million (£5.1 million). One Thousand Museum is located on the waterfront in Downtown Miami, close to Herzog & de Meuron's Pérez Art Museum and several other cultural buildings in Museum Park. Expected to reach 700 feet (210 metres) tall once complete, the building will feature communal spaces designed by Hadid and her team. These will include the ground-level lobby, to be surrounded by restaurants and event spaces at street level, and a double-height Aquatic Center and Sky Lounge at the top. Residences in between will range from townhouse-style properties at levels 10 to 14 and half-floor apartments from storeys 15 to 49, to full-level penthouses on the next eight levels and a duplex penthouse across floors 58 and 59. Another of Hadid's projects in the US, the 520 West 28th residential complex in New York's Chelsea, is also almost complete. Amenity spaces inside the building were recently revealed, after Instagram users captured images of its exterior from the adjacent High Line park.